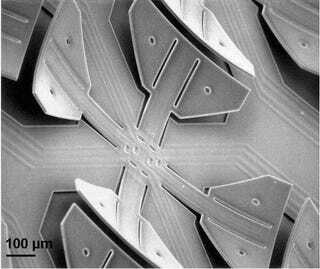 What you see here is one of the 128 groups of "feet" that allow a centipede-like microrobot to move around. Made from an old microchip, this robot can carry a record-breaking seven times its own weight and has unprecedented mobility. This new microrobot is a mechanical centipede, the first of its kind at such a tiny scale; it measures one inch long by a third of an inch wide, and it's as thick as a human fingernail. Its 512 feet are made of an electrical wire placed between two materials, one of which expands under heat slightly more than the other. When a current travels through a wire, it heats the two surfaces and the unequal expansion of the two materials causes the foot to curl. When done to all 512 feet, this makes the centipede shuffle forward at a rate of 20 to 30 sets of foot curls each second. The feet have such a massive disparity between their surface area and volume that they can warm up and cool down in just 20 milliseconds. The total mobility offered by its menagerie of feet gives it another big advantage compared to other microrobots. The robot currently derives its power from an array of tiny wires that transmit power and information, but that might soon change. The researchers piled paper clips on the robot until it was carrying more than seven times its own weight, which would be enough for it to support a battery and circuit board. That would make the robot fully independent, and even that is only a part of what the microrobot can eventually do once the researchers optimize its design. As it turns out, this microrobot started life as just another computer chip, first designed to work in a paper-thin scanner or printer. It was later retrofitted as a docking system in orbital satellites, but the scientists noticed its moving components acted a lot like little feet. So they flipped it over and turned it into a centipede robot. It's frankly amazing that this accidental robot has already worked as well as it has, and the thought is that simple modifications could eliminate up to 90 percent of its current power needs. The big challenges, like those for most other microrobots, lie in its speed and prospective battery life. Currently, it could only hold a battery that would give it about ten minutes of life, and scientists need microrobots that could run independently for days to be truly useful. It's also almost glacially slow, with a top speed of three feet per hour, which actually is about average for microrobots. If these problems can be solved, this silicon centipede will be hugely useful in exploring collapsed buildings, collecting environmental data from inaccessible places, and generally working wherever larger beings, be they human or robot, cannot go.